Contrary to many reports, Mother Nature decided not to rain on the MLB’s “parade” and, instead, got a front row seat to watch the American League, led by Angels’ sensation Mike Trout, secure home field advantage for the World Series in a 6-3 victory against the National League at the Great American Ball Park in Cincinnati on Tuesday night. This win was the third straight for the AL and narrowed the all-time gap between the red and blue rivals, 43-41, which is a plus for the AL and their fans. Trout, who was named the game’s MVP, became the first back-to-back All-Star Game MVP and wasted no time in staking his claim for the award. Trout set the tone with a leadoff home run off NL starting pitcher Zack Greinke at the top of the 1st inning to give the AL an early 1-0 lead. It was the first homer to lead off the All-Star game since Kansas City’s Bo Jackson did it in 1989, which is pretty good company for the 23-year old slugger, to say the least. Trout was obviously just one of the big names featured in the 86th annual edition of the game as both squads showcased talent both old and, mostly, new. 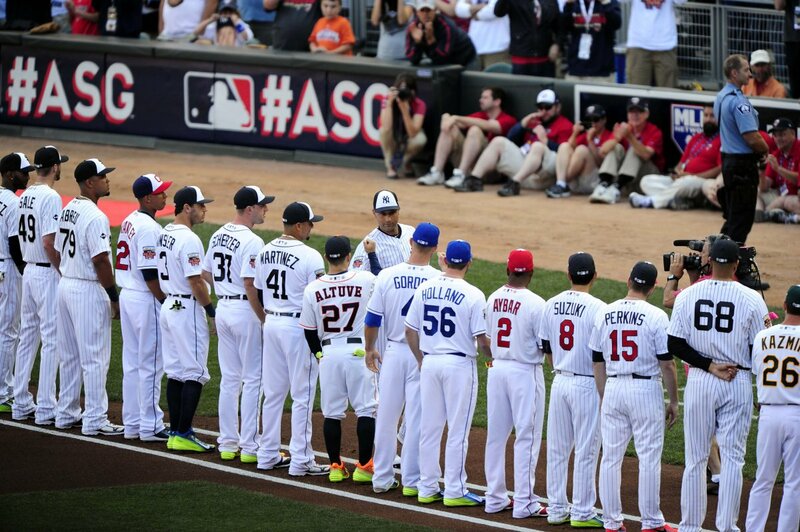 The rosters featured 35 players, age 27 or younger; 28 first-time All-Stars; 16 foreign-born players; and two rookies: Kris Bryant (Chicago Cubs) and Joc Pederson (LA Dodgers). It’s also worth noting that the AL may have been foreshadowing their continued dominance with “royalty” seemingly being their theme. The team included seven players (four starters; one of which was injured) from the 2014 AL Champion Kansas City Royals, the most since the Texas Rangers sent eight in 2012. The 2015 festivities narrowly avoided joining the 1969 spectacle as the only two MLB All-Star games that were rained out; a fairly incredible stat for an event mostly held outdoors. The NL defeated the AL, 9-3, at RFK Stadium in Washington, D.C. that year with San Francisco Giant great and Hall of Famer Willie McCovey earning the game’s MVP honors. In addition to McCovey, the game featured fellow Hall of Famers Hank Aaron (Atlanta Braves), Frank Robinson (Baltimore Orioles) and, Mr. October himself, Reggie Jackson (Oakland Athletics), a five-time World Series Champion. While that game featured established vets, this game may forever be remembered as the start of a new era for the MLB with hints of a youth movement seemingly taking place. Fans of both leagues should be in for a great treat as we enter the second half of the season and things are beginning to look up for the sport and its popularity similar to the hits these “youngsters” send out the park on a weekly basis.